At Sage Financial Group, we do not see our clients as an opportunity for a transaction. To provide effective financial solutions and sound financial advice, we get to know you as a means to fully understand your objectives and motivators. The right financial guidance is essential for you and your family. Get your children’s education fund growing, start building your nest egg, or pave the way to a comfortable retirement with Sage advisers. Provide you with the best advice for your financial situation. Put your requirements above any consideration of ourselves. Ensure all advice complies with current rules and regulations. Employ advisers and staff with the experience and knowledge you expect. Provide continued training and development for our advisers and staff. Provide you with financial education and information, including our advice. Act professionally and responsibly in all of our dealings. Charge fairly and disclose and explain all charges. We will provide you with a picture outlining a tailored financial plan that you can see and understand. This plan will show you the various results when choosing between our services. We thrive on empowering and encouraging our clients to get on the road to a financially secure future. Clients are often referred to us after becoming dissatisfied with their previous financial planning services and are amazed by what a full financial planning service actually offers. We provide value and our clients often come from not having a comprehensive understanding of how their money can truly work for them. The Sage difference is summed up by our FHP ongoing service proposition. We offer a ‘whole-of-life’ service that doesn’t stop when you reach a goal, or retire. Should a client pass away, we are there for their following generation. We do that by offering the FHP, a continual re-engagement process that opens up and addresses opportunities as the clients’ objectives and priorities change. 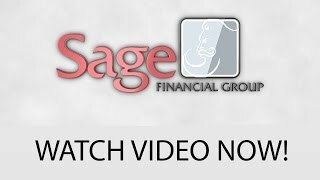 Sage Financial Group is more than just a financial service. We are there for all clients as a financial planning mentor, guiding your finances and educating you on the finer points of wealth management, investment and preparing for retirement. Each day that passes is a loss for your financial portfolio. Contact our advisers today for further assistance.